Great Small Works’ 9th International Toy Theater Festival officially opened Sun May 30 and the kick-off was heralded through the streets of DUMBO with the Greatest Smallest Parade. A monumental theatrical event on the smallest of scales! With an eclectic range of theater miniaturists from around the world and around the neighborhood, Great Small Works celebrates an all but lost 19th century theatrical form. This spring, a breathtaking and powerful lineup of productions, both classic and experimental, will make their home at St. Ann’s Warehouse. For two weeks, enjoy miniature performances in intimate spaces, with programs for adult audiences, a special show for the entire family, symposia and workshops, a late-night cabaret, and the Temporary Toy Theater Museum, an exhibition of historic and contemporary examples of that intricate, stunning, and adaptable entertainment called Toy Theater. Holland’s Hotel Modern will also join the festival this year with their captivating production of Kamp. Hotel Modern attempts to imagine the unimaginable. An enormous scale model of Auschwitz fills the stage, brought to life by thousands of 3” tall handmade puppets enacting the greatest mass murder in history, committed in a purpose-built city. The actors move through the set like giant war reporters, filming the horrific events with miniature cameras; the audience becomes the witness. The Toy Theater Festival and Kamp are supported by: NY State Council on the Arts, NYC Department of Cultural Affairs, Consulate General of Spain, Scherman Foundation, Mental Insight Foundation, Mexican Cultural Institute, Emily Davie and Joseph S. Kornfeld Foundation , the NEA and the Jim Henson Foundation. 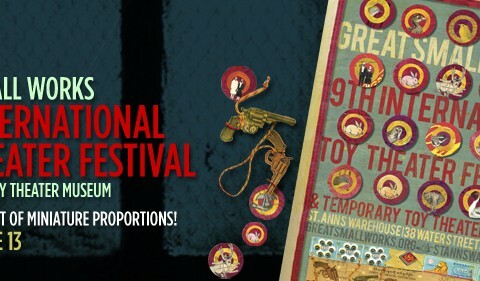 The tiniest blockbusters in town… a wonderful array of new, experimental and traditional toy theater productions. All the realistic elements contribute to a performance that is so gripping that when it ends the audience is unsure whether to clap of leave the theater silently.